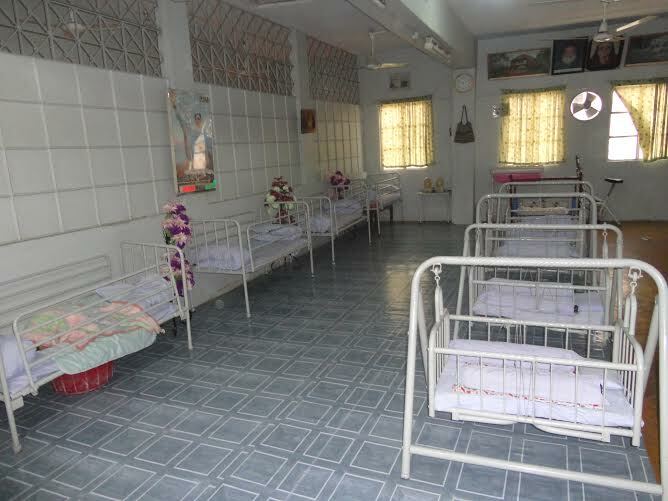 Cribs at creche for abandoned children at Edhi clinic in Karachi, Pakistan. Abdul Sattar Edhi may be the founder and head of Pakistan’s largest social welfare organisation, but the legendary philanthropist still lives in the back of his first medical clinic in the heart of a Karachi slum. “I’m a beggar. I’m happy to stand on the road and ask for alms,” he says. “He is an international beggar,” his wife, Bilquis, chimes in, laughing. Opened in the 1950s, the Mithadar clinic is today part of a sprawling network of medical centres, mortuaries, adoption and ambulance services serving Pakistan’s poor and destitute, as well as refuges for homeless men, women and children. Such services are vital in a country with effectively no state social welfare apparatus. And the Edhi Foundation, which is largely funded by public donations, also provides humanitarian relief in disaster zones around the world. Earlier this year, Nobel laureate and Pakistani women’s rights activist Malala Yousufzai and her father Ziauddin spearheaded a campaign for Mr Edhi to be nominated for the Nobel peace prize for his decades of charity work at home and abroad. But the social activist, who estimates his age to be close to 90, insists the work itself is its own reward. Mr and Mrs Edhi live in rooms attached to the three-storey Mithadar clinic, which also hosts a crèche and school for abandoned children. Located near the coastal rim of Karachi, ambulance vans emblazoned with the logo of the Edhi Foundation are stationed outside, ready to navigate narrow, littered unpaved paths bustling with vendors hawking street food. The air is thick with smog, and the pressing rush of the city’s bursting population. Sporting a straggly beard and dressed in a plain shalwar kameez, Mr Edhi looks and lives exactly like the poor he serves. And his refusal to accept aid or money from powerful figures seeking influence has given him kudos in a society driven by conspiracy theories and suspicious of foreign interference. But, after decades working around the clock on a punishing schedule, Mr Edhi’s health is failing. His son Faisal, helps to run the Foundation’s day-to-day operations as his father makes hospital visits for dialysis treatment twice a week. Abdul Sattar Edhi in Mithadar, Karachi. Born in the state of Gujarat, India in 1928, Mr Edhi migrated to Karachi with his family in 1947 during the partition, as Pakistan was carved out of newly independent India as a homeland for the subcontinent’s Muslims. Even as a young man, Mr Edhi was passionate about alleviating the poverty and suffering he saw around him, his wife says. He began his social work career equipped with an old van he used to pick up the bloated abandoned bodies of drug addicts and the homeless on the street before preparing them for burial. Mrs Edhi was a teenager when she started working as a nurse at the Mithadar clinic and was proposed to by Mr Edhi. The pair share an easy-going intimacy. When they work together, her banter is a counterpoint to his stern seriousness. Mr Edhi, credits his wife for the support that has enabled the couple — both from Karachi’s most impoverished quarter — to accomplish what became their shared mission. “I never went to school. The environment has been my teacher. I have become human by learning through my world,” he says. “I don’t even know why my wife liked me … I’m lucky my wife accepted me,” he adds, smiling wryly. The partnership has not been without its challenges. The couple’s four children were raised by Mrs Edhi’s late mother as the pair dedicated their life to social work. The couple’s son, Faisal, who is poised to take over as head of the Foundation, has been working alongside his father for the past 15 years. He remembers eagerly awaiting his father’s weekly visits as a child. In Ramadan, he would wait on the footpath until his father arrived to break fast, sometimes hours after sundown. Faisal and his wife Saba live in a simple home in neighbouring Kharadar with their four children. Unlike his parents, Faisal is openly scathing of the failures of the Pakistani state. “The biggest problem is corruption and this can only be resolved by the redistribution of wealth,” he says. Faisal adds that his father always loved “revolutionary” people, which often pit him against those with power. Mr and Mrs Edhi have played host to the world’s most famous politicians and celebrities. Comically, however, the couple rarely recognise the identities of the famous faces that come to visit. “He looked like a fakir [an ascetic existing on alms]!” Mrs Edhi laughs as she points to a haggard-looking Sean Penn in an album. While Pakistani politicians also come to pay court and garner favour, the couple say their work has pit them against powerful interests. Mr Edhi’s most vociferous critics are the religious right. He has been accused of promoting immorality for providing a refuge for abandoned children and women escaping violence. His insistence on an inclusive spirituality and serving the community regardless of caste, class or creed make him both revered and — in some quarters — reviled. “There is no religion higher than humanity,” he says in response to the criticism. Mrs Edhi recalls a young boy asking her opinion on religious figures who declare her husband an “infidel” and claim the pair will be locked out of heaven for taking care of “illegitimate” children. The story was originally featured in The National. You can read the full piece here.